5 County Clare - The Home Of Polkas? 10 The Shteday Set... 'hat? Write about Return Of The Giant Sock Monsters From Outer Space! 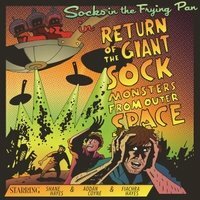 Want to write a review about Socks In The Frying Pan's Return Of The Giant Sock Monsters From Outer Space album? Post your comments in this box to be displayed in our community forums and in our album database! Please make sure you are logged in before proceeding. Please login to write your comments about Return Of The Giant Sock Monsters From Outer Space.